Psoriasis is a chronic skin disease that causes skin cells to grow too quickly, resulting in thick, white, silvery or red patches of skin. Normally, skin cells grow gradually and flake off about every 4 weeks. New skin cells grow to replace the outer layers of the skin as they shed. But in psoriasis, new skin cells grow and move rapidly to the surface of the skin in days rather than in weeks. Thus, they build up thick patches known as "psoriatic plaques". These patches or plaques range in size from small to large. They frequently appear on knees, elbows, head (scalp), hands, feet or lower back. There are different types of psoriasis, in so far as how these psoriatic affections look on the diseased skin on various parts of the body. Is Psoriasis More Common Among Children Or Adults? Psoriasis is more common among adults. But children can get it too. Why Psoriasis Can Be A Problem? Having psoriasis can be embarrassing, especially when it regards the aesthetic aspect of the skin and also when it starts itching. People having psoriasis cannot show their bodies in places like beaches, swimming pools, etc. 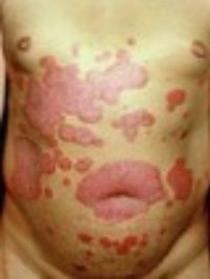 where the psoriatic patches are visible to others. Can Psoriasis Be Completely Cured Today? We cannot still talk of complete cure but there are treatments existing that can help keep psoriasis under control and bring it to remission. Laser treatment can help clear out all psoriatic lesions from the skin. the stage of psoriasis - beginning, mild, moderate, advanced or very advanced stage. the individual reaction of the patient's body to recovery. the regularity of the patient's treatment sessions. the presence of parallel diseases and their treatment. The laser treatment course is carried out parallelly with a course of intake of medications. normally of plant origin. There are no side effects from laser treatment.